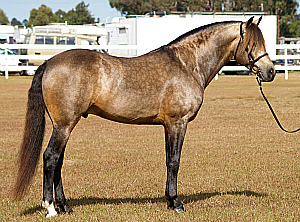 Studbook Buckskin / Smoky Black Register: mares & stallions - must have 2 registered parents. Proof must be provided. Must PASS conformation standards. Non-studbook Buckskin / Smoky Black Register: mares & stallions - either one or both parents are unknown / unregistered or unprovable. Must PASS conformation standards. These buckskins have full showing rights. Gelding Register: may have either registered or unknown / unregistered / unprovable parentage. Must PASS conformation standards. All horses / ponies being presented for registration as either a smoky black or a brown buckskin will be required to undergo DNA testing for the cream factor if it is determined by the registrar that there is not sufficient physical evidence of dilution. Must be a black based horse or pony carrying one copy of the cream dilution modifier regardless of agouti status. Horses and ponies carrying a second dilution modifier will be registered under that dilution for their primary registration but may also be registered as a composite dilute if they meet skin and eye colour requirements ie a buckskin dun will be registered as a dun first but owners can opt to have them registered as a buckskin as well (composite registration). Be permitted white markings on the face and legs only, the legs not to be white above the knees or hocks save for a continuous diminishing spear or stripe running above the knee or hock. NO buckskin or smoky black may have ANY white markings (ie belly splashes) other than those permitted under the Regulations of the Company. Not exhibit any appaloosa characteristics. Solid horses and ponies with appaloosa/palouse/spotted pony parentage must be DNA'd for Lp and must return a negative result to be eligible for registration as a buckskin or smoky black. Horses carrying Lp can be registered as DA Non Solid Dilutes. CREAM BUCKSKIN - the palest shade of buckskin; a pale cream or buff colour with dark points. STANDARD BUCKSKIN- a yellowish body colour. Mane, tail and legs are black. May be clear coated, dappled or sooty. GOLDEN BUCKSKIN - a nice deep gold body colour. Some of the richer colours are hard to distinguish from the bays, particularly the copper bay, but they are lack the 'redness' that bays have. One of the most common ways of distinguishing between the two is by looking at the iridescence: a buckskin, like a palomino, will have gold or metallic silver iridescence whilst a bay will tend to exhibit copper or orange iridescence. BURNT BUCKSKIN - also known as sooty buckskin. At one stage sooty buckskin was incorrectly known as brown grulla when it was thought that buckskin, dun and grulla were each controlled by the same genetic mechanism. However, it is now known that this is not the case. have produced single cream dilute progeny to proven non-cream dilute partners. SMOKY BLACK - this is the darkest shade and occurs on a base colour of black. This colour is also referred to as black buckskin and dilute black. Smoky blacks registered with Dilutes Australia Ltd are eligible to be shown in classes for buckskins. These horses and ponies do not carry agouti and breeders should be aware when using smoky blacks for breeding buckskins that the other parent must carry agouti if a standard or brown buckskin is the desired result. Click here to see photos illustrating the various shades.